If you are having issues with Windows 10 speed, then you can try changing some services that you may not require all of the time that may be running in the background. 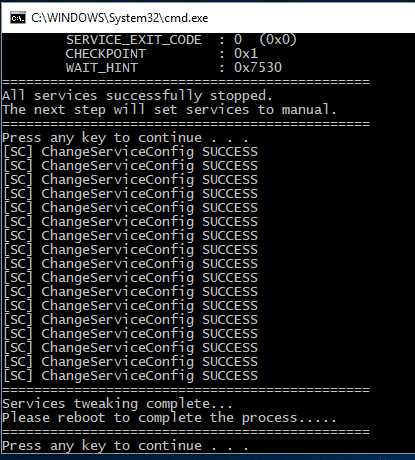 Our utility changes non-important services to manual instead of automatic. If you are having issues with Windows 10 speed, then you can try stopping some computer services that you may not require all of the time that may be running in the background. You can then set this services to manual instead of automatic which means that they will not just start when you boot up your machine, but will start when they are needed.Our utility will go through the following services and change the startup mode to manual from automatic:Connected User Experiences and TelemetryDiagnostic Policy ServiceDiagnostic Tracking ServiceDistributed Link Tracking ClientdmwappushsvcDownloaded Maps ManagerIP HelperProgram Compatibility Assistant ServicePrint SpoolerRemote RegistrySecondary LogonSecurity CentersuperfetchTCP/IP NetBIOS HelperTouch Keyboard and Handwriting Panel ServiceWindows Defender ServiceWindows Error Reporting ServiceWindows Image AcquisitionWindows SearchReboot and this should speed up your machine! LockCursor simply locks the mouse cursor. You may choose a predetermined area, the primary or secondary monitor screen or part of the window of a particular application.